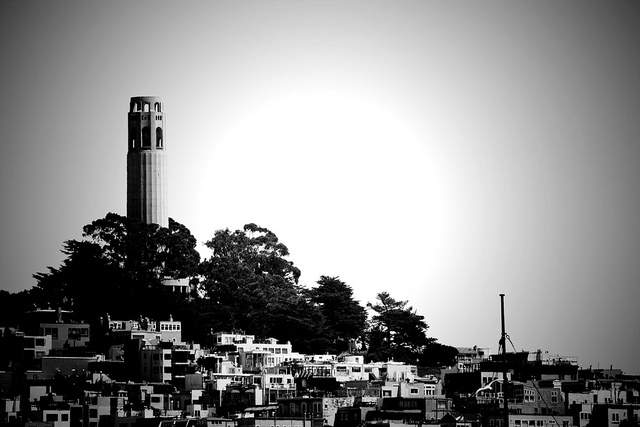 CreativeLive has a love affair with San Francisco. The home of one of our offices, the city constantly inspires our staffers with is beauty and vibrance. And, of course, its architecture. For this installment of One Place, we’re looking at one of San Francisco’s many recognizable structures, the Coit Tower. 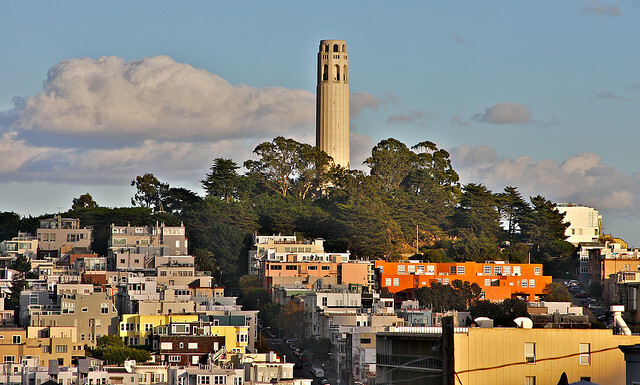 Fully named the Lillian Coit Memorial Tower, the tower was constructed in 1933 and stands 210 feet tall. 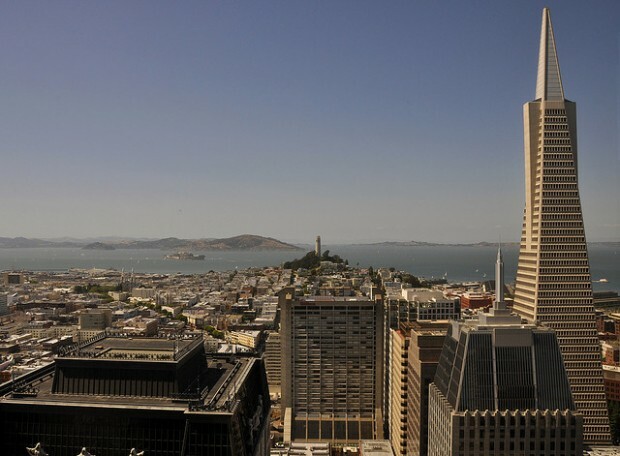 The tower is visible from many places in the city, and has served as a reminder of San Francisco’s history of beautiful buildings and fascinating people. Its namesake, who regularly smoked and wore pants long before either of those behaviors were fashionable or even socially acceptable for women, left one-third of her estate to the City of San Francisco specifically for the purpose of making it a more attractive place. 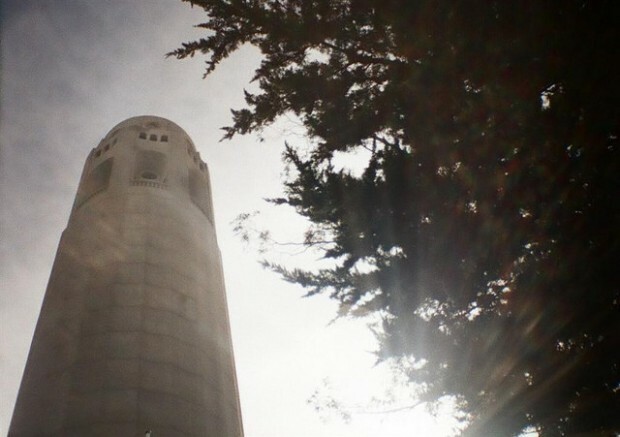 After her death, the tower was designed as a testament to her love of the city. Today, the tower remains free to the public, and has been the subject of various modern art installations and other civic activities, at times being lit in a variety of colors in support of local sports teams and other causes. 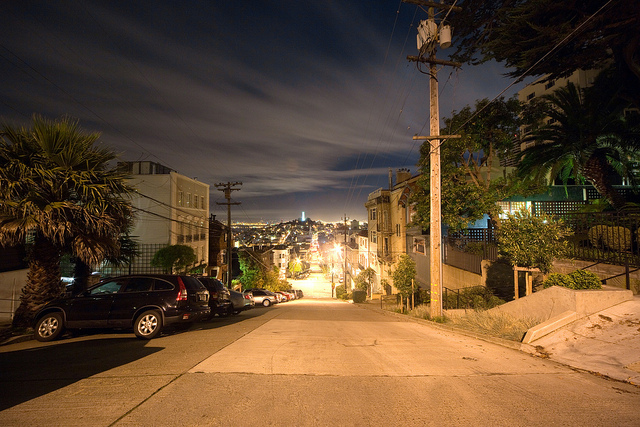 It also provides a great deal of inspiration for photographers, who are drawn to its art deco exterior and picturesque placement on Telegraph Hill. Let’s start with a pretty basic — but beautiful! — way to capture this structure: From far away. Incorporating the colorful structures and often-complex San Francisco sky is a great way to demonstrate the scale of this building. 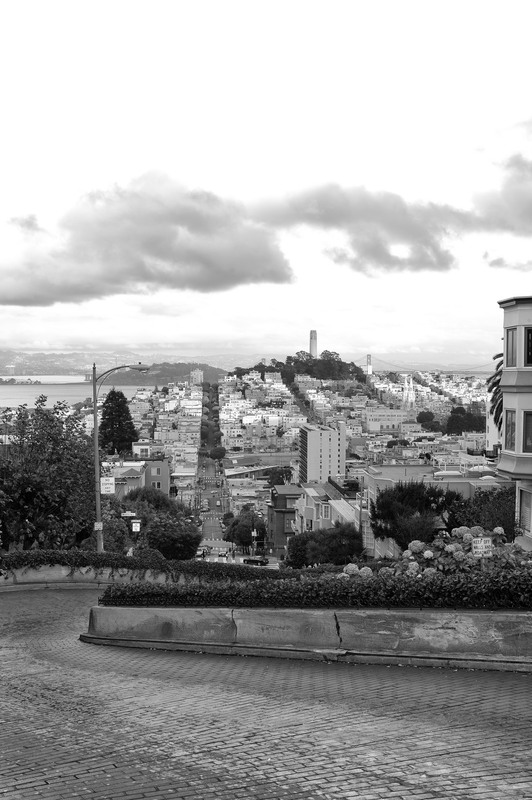 A popular place from which to shoot Coit Tower is the curves Lombard Street, San Francisco’s notoriously windy, steep road. In fact, people have been shooting from this angle for decades. 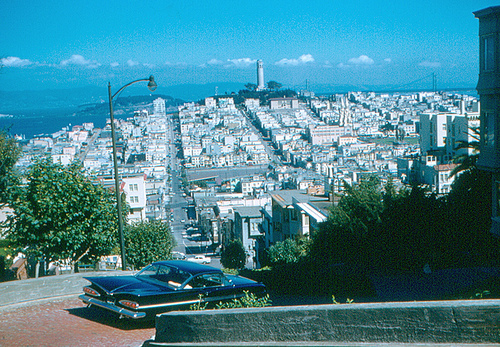 Here’s an image from 1959. 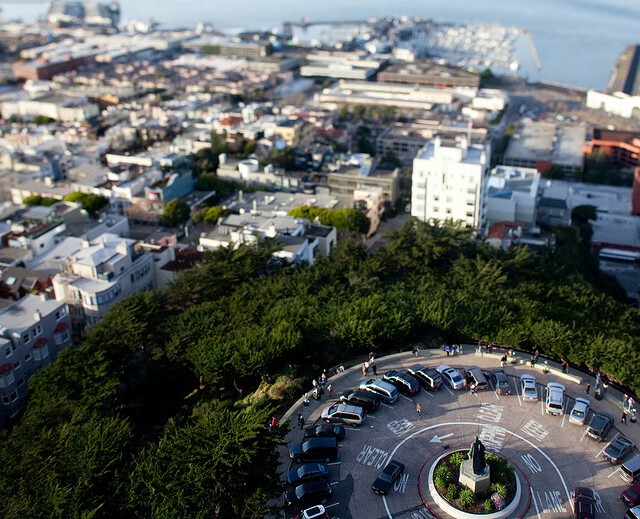 You can also shoot Coit Tower from really, really far away. 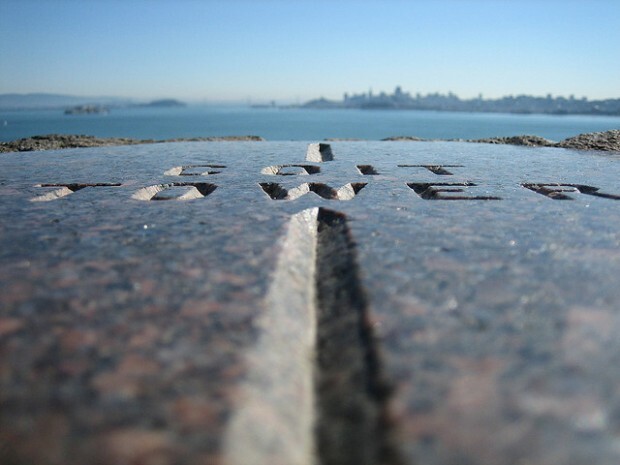 This sign, which tells tourists which way to look for the tower, is on the north side of the Golden Gate Bridge, all the way across the water. Of course, access inside of Coit Tower is also permitted, so plenty of photographers have captured the many historic murals, commissioned the year it was built. 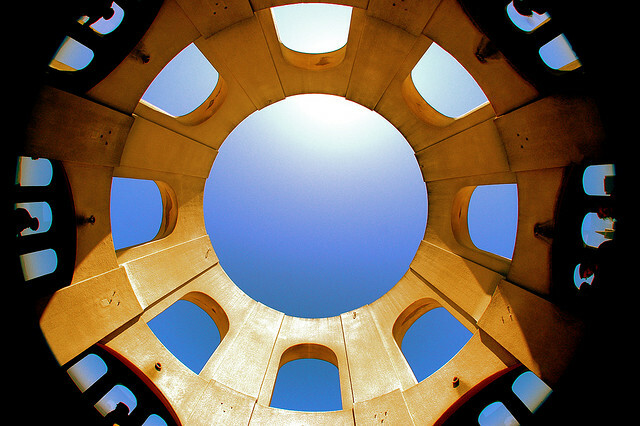 Others focus more on the architectural details, like in this image. …Or the view from the Coit Tower, which is technically still an image of the place, right? Even the parking lot is kind of design-y. But you don’t even need to get very close to take a photo. You can see Coit Tower from a lot of different places in San Francisco. It looks majestic in black and white. 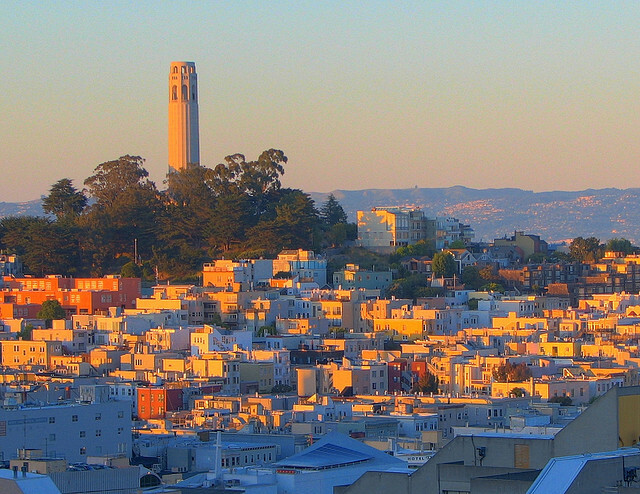 …And at the golden hour. …And pretty much all the time.